A lot of nixie tubes have been made in Russia, or more accurate, the USSR. These are still fairly easy to find and in some cases, quite affordable and just a few euro’s per nixie. Sadly I couldn’t find a nice overview of all the nixies made by the USSR. Some other popular displays are the VFD and numitron displays, both are also vacuum glass tubes and also used for DIY clock projects. 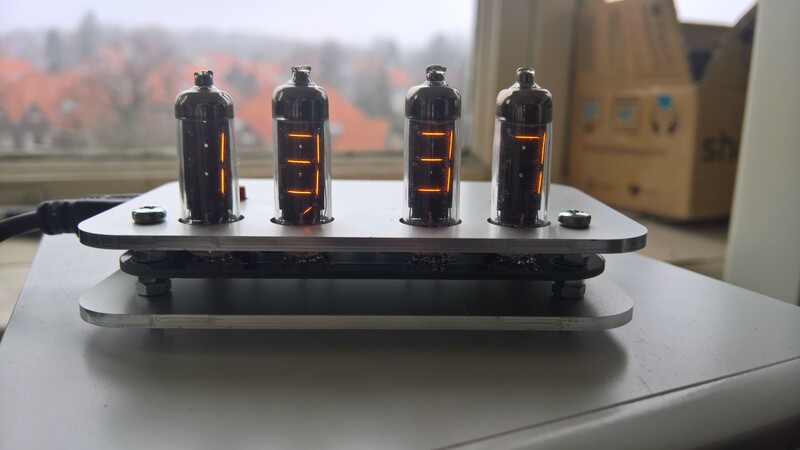 This page will try to be a complete overview of all the nixie, VFD and numitron tubes in the popular IN and IV series. For a few projects I like to use 7 segment displays to indicate a value like voltage, current or temperature. 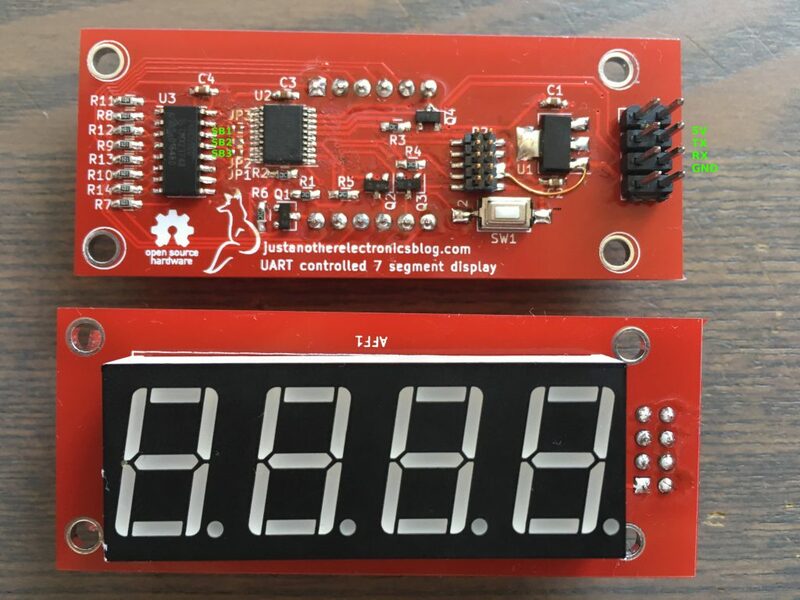 7 segment displays are cheap, easy to read and easy to control. The biggest downside is that it can cost a lot of IO pins on a microcontroller to control a handful of 7 segment displays. One option is to buy finished 7 segment displays on Ebay that can read in a voltage. The downside of these is that the accuracy is not great and they can only be used if a certain range in voltage is what you want to display. The hardware is simple, an ARM M0 microcontroller translates the UART messages to data for the 74HC595, some NPN transistors are used to select the digit. The reason for the, somewhat overkill, STM32F031 ARM M0 microcontroller is that it’s cheap, with a bit more then 1 euro per IC, it contains a UART bootloader, so other people that want to build this display only need a PC with a USB to UART converter and that it’s a microcontroller I’ve used often before. There is one bodge wire, I forgot to connect the GND from the 3.3V regulator to the rest of the PCB. In the files uploaded on my github this is fixed. 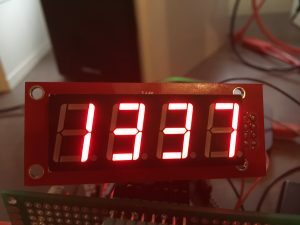 The 8 resistors of 100 Ohm close to the 74HC595 limit the current for the display. 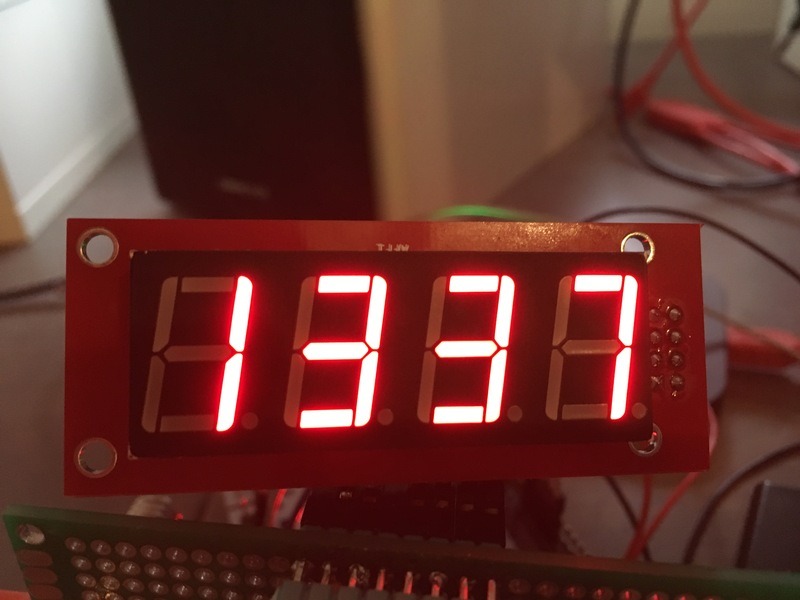 With the red 7 segment display used the current is a bit less then 10mA per segment, but these need to be recalculated for a different color display and on how bright the display has to be. Controlling them is easy, connect them to a PC or microcontoller, setup UART to use a 19200 baudrate and send a string formatted like this: “ID,VALUE\n”. For example: “07,1234\n” would make it display 1234 if the YASSD has 7 as it’s ID. Adding a dot is no problem: “07,20.01” will display 20.01. The ID is determined via the 3 solder bridges using the following formula: ID = (SB1 * 1) + (SB2 * 2) + (SB3 * 4). If a solder bridge is not present, SB is 1, if the bridge is present, SB is 0. This means that if there are no solder bridges present, the ID of the board is 7. By having YASSD’s with a different ID it is possible to connect a maximum of 8 on one UART bus. The hardware and software are both open source and can be found on my github. Let’s say you want to control an LED matrix. A plain boring 8*8 LED matrix you bought on Ebay a long time ago and is still somewhere in your desk. It’s pretty simple, after figuring out how multiplexing works you’ll have a smiley drawn on the LED matrix in no time at all. But it’s much prettier if the brightness of an LED matrix can be controlled via PWM, maybe make some nice animations as well. For an 8*8 LED matrix, 8 PWM outputs would be needed and you are good to go, something a bigger microcontroller generally has available. But what if you want a bigger LED matrix, 16*16 perhaps. And animations running smoothly at a high frame rate. For an 8*8 LED matrix, to make it look smoothly, you need to multiplex the screen at about 100 Hertz minimum. So set a column, wait a short time, switch to the next column and set the value for this column, wait a short time etc etc. With 100Hz there is 10ms of time per screen, so about 1.2ms (10ms / 8 columns) per column. More then plenty to set some IO pins to show an image. For a 16*16 LED matrix this time halves to 0.6ms. PWM makes this a bit harder, as a whole PWM cycle must fit in this 1.2 or 0.6ms, meaning the PWM peripheral must run at 833 or 1666Hz minimum. This is all no problem for a PWM peripheral in a modern microcontroller. But what if you don’t have 8 or 16 PWM pins? For example, an Arduino Mega has 12 PWM pins. ARM M microcontrollers like the STM32F103 have more PWM pins, but those are shared with other peripherals as well, so they might not all be available to use in a project. An option is to bitbang PWM, toggle an IO pin quick enough to act as an PWM pin. This has the major downside of costing a massive number of CPU cycles. To get just 6 bit PWM, so 64 different levels of brightness, in the 0.6ms for an 16*16 LED matrix, the CPU must check 64 times if that IO has to be set high or not. This means that every ~10us the CPU has to handle IO. If you also want to calculate some animation to display, the CPU will be very busy. This is where the DMA comes in. The DMA, or Direct Memory Access, is a peripheral available in many modern microcontrollers. Simply said, it’s a co-processor that can copy data from one place in the microcontroller to a different place without the CPU having to do a thing. It can be used to transfer an ADC value to a buffer in RAM and give a sign to the CPU when the buffer is full. 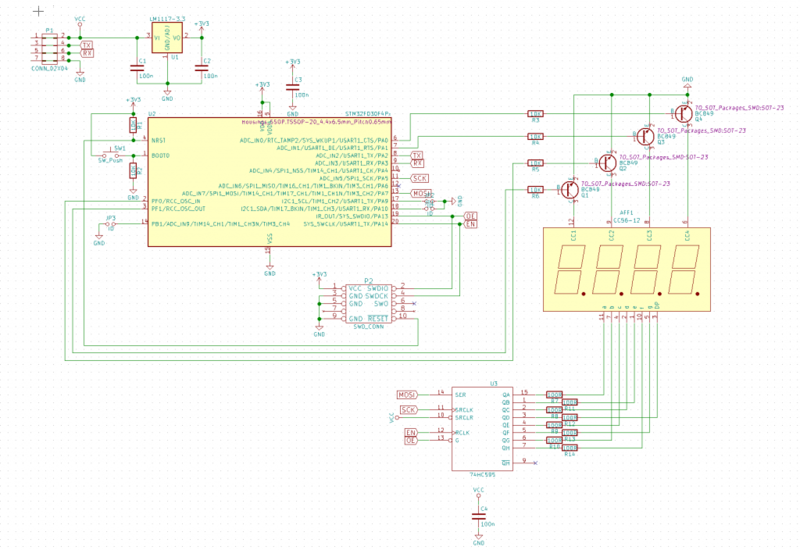 The microcontroller I’ve used for this blog, the STM32F103, can transfer memory to memory, peripheral to memory and memory to a peripheral without the CPU doing a thing apart from setting up the DMA. Transferring data to a peripheral without costing CPU cycles. That sounds like a nice way of driving an LED matrix. I wanted a numitron clock on my desk. As, in my opinion, a decent looking enclosure is one of the hardest things to make I made the clock in the size of an altoids can so just a few holes should be made for an enclosure that looks not too ugly. It’s almost fully in SMD and can be powered using a USB port, making it a lovely clock for almost every desk. In the end I ordered a custom enclosure from Schaeffer in Germany for a nicer looking clock. The previous post I explained the code for the dear ImGui part of the GUI. In this part the code for the serial connection will be discussed. The MBED IDE is an online IDE, which is less pleasant if you want to work without internet or prefer your own editor. Luckily it is possible to export an MBED project and use an offline compiler. It can export to KEIL, GCC and a few others. KEIL is a well known IDE now owned by ARM. They offer a free 32KB limited version and with the Tinycortex having 32KB of flash memory that limit is no issue. KEIL is Windows only and the unlimited version is quite expensive. A guide on exporting to KEIL can be found here. Because KEIL just works it’s the recommended way for offline compiling. Sadly enough it’s not possible to just copy the generated .bin file on the tinycortex. With just the makefile the binary file isn’t checksummed. A small script in the “Tools” folder called checksum is used to checksum the file. Place it in the folder with the binary and run it with the command “./checksum filename.bin”. The checksum script is compiled for Linux, OS-X or Windows users need to recompile it using the command “gcc -o checksum checksum.c”. Linux and OS-X users have to use the dd command to place the binary on the Tinycortex. Look at this, my first post on my first blog, who knew. Something about myself, I am a 20 year old student from the Netherlands studying Embedded System Engineering. I also started my own company with 2 other students called BRC-Electronics which you can read more about on www.brc-electronics.nl. I will try and use this blog to post about my electronics experiments and thoughts as a form of reference for myself and for others.